Those who visit our website on their desktops or laptops will notice no change. Those using their smartphones and other cellulars will take deep breath of relief. They will not wait ages until they see the page on their screen and manage how to read it. Our website went mobile! In fact it is still the same page but its software recognizes what kind of browser you are using. Whenever it notes you are connected from mobile device you will download the website using light mobile theme. This is a change that makes difference. Your action is not needed. It saves your time, saves your data plan quota. It lets you browse more comfortable and much faster. Most functions are available in mobile mode. First of all, our news will come to your device faster and easier when read on Go. If you don’t want to view the page as “mobile” you can switch your device to “desktop” anytime and back. To change from mobile to desktop scroll down to the bottom of the displayed page and tap on the link “switch to our desktop site” and that’s it. No more action. When you would like return to mobile mode tap the link “switch to our mobile site” on the bottom of the page. However some of the content might be not visible in mobile version. 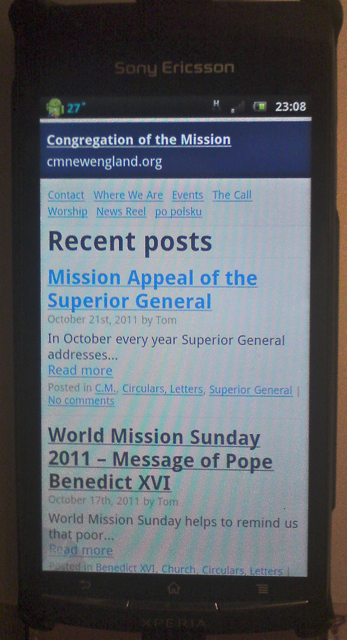 Our tiny app for smartphones: “Vincentians New England” is another solution which can encourage you to get latest news from our community and Vincentian Family. More about the app and how to get it could be read from THIS POST. If your device can read QR Codes you can scan the code here and then follow instructions on the screen to open the website and bookmark it.